JS ENVIRONMENT is a supplier of Single, Multi-Bag, Duplex Housings, Bag Filter Systems and Self Cleaning Filter System in China. 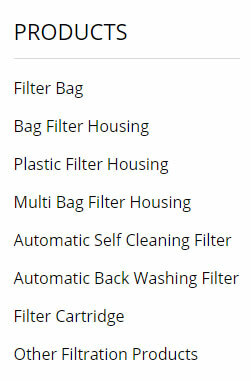 Bag filter housings & Filter bags have been exported to the United States, Britain, Spain, Brazil, Chile, Australia, Malaysia, Japan and other European and American and Asia Pacific region many countries and regions. At the same time are also familiar with the major foreign brands filter products. Any inquiry, please contact with us. P-Style stainless steel bag filter housing from JS ENVIRONMENT is the best choice for industrial, commercial and OEM applications. A-Style Sidein Single Bag Filter Housings offer the most cost-effective solution to single bag filter housing requirements. Topin bag filter housing side inlet, flow through the top design results in a minimum headroom of unfiltered liquid for easy bag change out, as well as providing optimum sealing of the filter bag. ECO Single Bag Filter Housings are the light-weight bag filter housings combine quality and value. bag filter housings are for applications where the system flow cannot be shut down for filter bag change out. Multi Dulpex Bag Filter Systems are for applications where the flow rate is too high for a single bag filter housing. Multi bag filter housing is designed with a proven swing eye-bolt or segment clamp closure mechanism. If you buy our multi bag filter housing, you can wait for a long time to change the used filter bags. The QLM Bag Filter Housing defines the sitate of the art for multi-bag Filter Housings.The QLM unlque quick opening spindle closure mechanism provides for a 20 second opening--without tools. Carbon Stell Bag Filter Housings offer the most cost-effective solution. B-Style Multi Bag Filter Housings offer user friendly, cost effective bag filtration for high volume applications. COPYRIGHT© 2019 SHANGHAI JS ENVIRONMENT EQUIPMENT CO., LTD.